Happy, Blessed New Year Family & Friends! 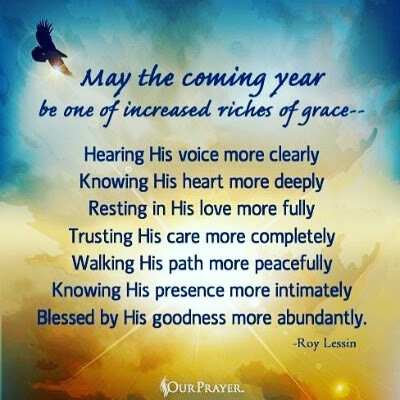 God bless you abundantly with supernatural favor and divine grace! 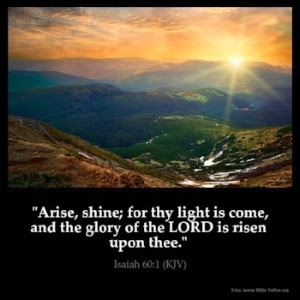 May you experience a greater revelation of The Father’s fiery love, amazing joy and incredible Shalom for you and then give it away to everyone you meet! Because SOMEBODY is waiting to Encounter the LOVE of The Father… More Lord! 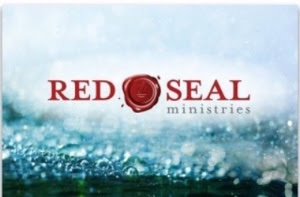 Join Jerame & Miranda Nelson, Doug Addison, Charlie Shamp and Andrew Hopkins for Decree 2019! Join us for the New Year 2019! We welcome back Wayne Anderson and Kevin Ford with guest worship leadersRey and Sierra Richardson! Healing & Power-Evangelism Training with Fielding Cage! Start 2019 off by getting better equipped to serve your world! 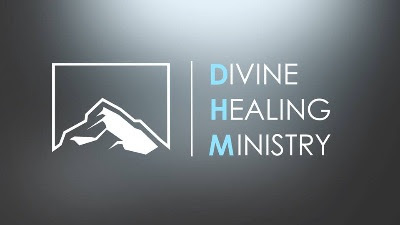 Fielding Cage (from https://goharvesting.com) will be giving a FREE one-hour training on Divine Healing and Power-Evangelism! There will also be opportunity to immediately put into practice what you’ve learned! Spread the word!!! We’re so excited for the First OVERFLOW OF 2019! We’re believing and declaring that the sounds of Heaven will be released! COME ON, JESUS! We start immediately after the 6pm service. There’s no childcare, but children are absolutely welcome to stay and worship with their parent! Spread the word! Join us for our first meeting of 2019! 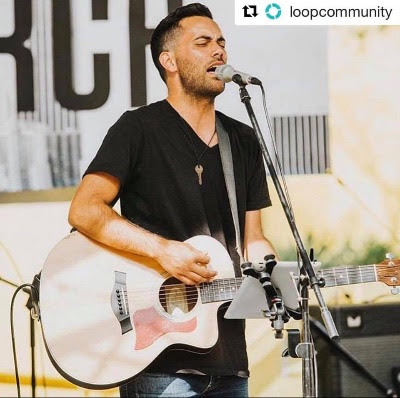 Andrew Hopkins will lead us into the fiery love of the Father through worship! 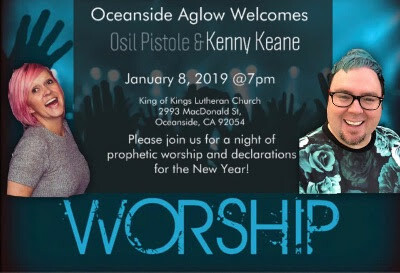 Osil Pistole & Kenny Keane will he ringing in the New Year with a night of prophetic worship and declarations! Our first gathering of 2019! We are so excited for this next season as Kingdom Writers. Come on out and join us to be encouraged, equipped, and empowered by God like never before. It is time to soar as a called Kingdom Writer! There is something God has placed inside of you as a writer and it is time to tap into that calling and discover the depth of what it is. We have over 150 KWA members. Are you going to be a part of what is happening here in San Diego and beyond? We believe San Diego will be the Hollywood for Writers and we take our writing seriously…it is not a hobby at KWA. Books are being released every year at KWA. Are you the next one to release a book into the world? Let’s do this together. $60 membership gets you all the monthly gatherings for free and covers you for a full year at the point of when you joined. Discounts to conferences and more. 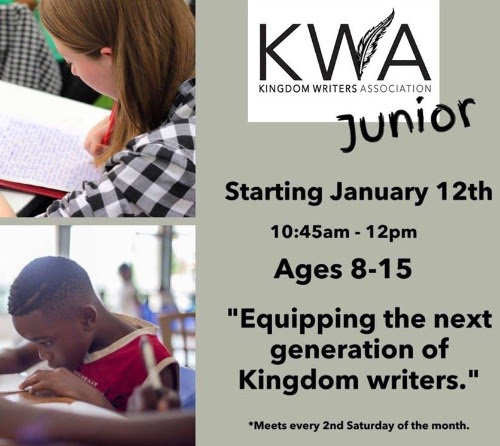 We are excited to launch our first gathering for Junior KWA on January 12th. It is time to pour into the next generation of writers. God is calling us to gather his scribes and give Him room to speak. This is open for 8 to 15-year-olds and is FREE. We encourage parents to join us. Leaders will equip, empower, and encourage the young ones in their writing. We will have encouraging words, we will pray for God to reveal stories to us, there will be writing prompts, and a time for them to share what they wrote. Parents are welcome to join the children but the focus will always be on the children where we will pull on heaven and write on earth. We will not be teaching the children how to write but will explore their creativity through the imagination God has blessed them with and create a safe environment for that exploration with the Holy Spirit being our ultimate teacher. This will be led by Pastor Brae and Jill Wyckoff. We have other leaders as well from our KWA family assisting. Kingdom Business Association had over 30 people show up last month. A dozen people with businesses over 2 years old, a dozen more with businesses less than 2 years old, and the remaining looking to start their own business. Come and join us for our Kingdom Business Gathering of KBA. Hear from the Director of KBA, Craig Muster. This is all about creating space for God to show us and lead us into creatively and wisely producing wealth. KBA will follow after our Kingdom Writers gathering. KBA is free for everyone so please invite those you know who are interested in creating Kingdom wealth. 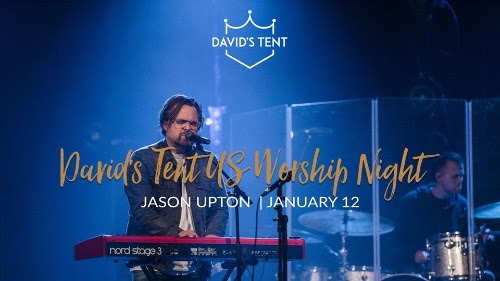 David’s Tent SoCal is hosting another worship night Saturday, January 12th with Jason Upton. 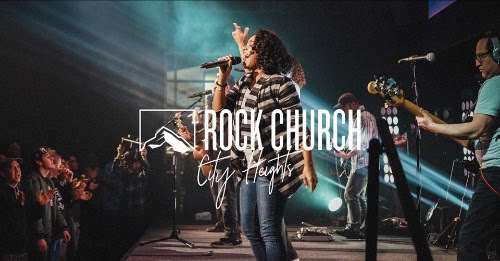 Each of our worship nights are really special times to experience the presence of God together and look ahead to our 72-hour worship festival next October 2019. Seating is limited and tickets will be on sale very soon. You can get more info about our upcoming festival, how to become a team builder, and much more at: www.davidstent.net. 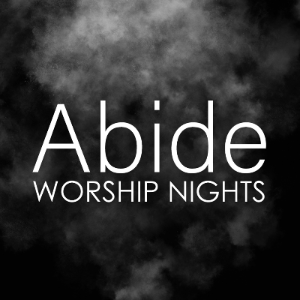 Tell your family and friends about this powerful worship night and we will see you there! Every month CCF has a guest speaker for their Healing Prayer Service. 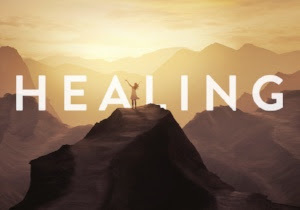 Invite everyone who needs a healing! Come expectant! Join us for our Open House event for the 2019 Spring Term. 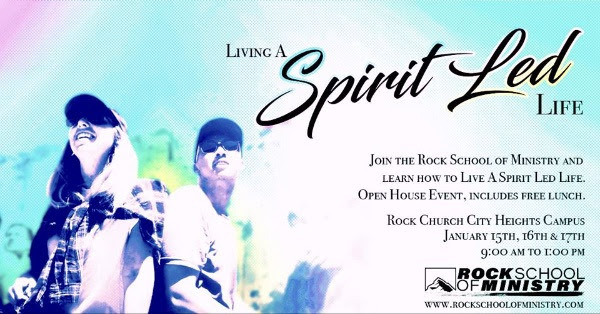 Learn about Living a Spirit Led life, join us in fellowship and worship… And free food. We are excited to see you all there! Modern society is facing its greatest challenge yet. Yet, there is a breed of Leader emerging that carries both the ancient and the new. 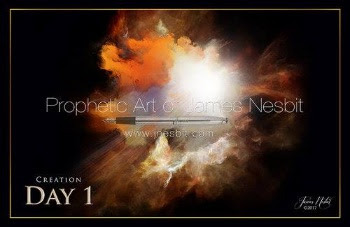 They are grounded in the ancient wisdom and truth of God and simultaneously, they explore and create new ways of expressing God’s love, truth and power to the world that so desperately need them. 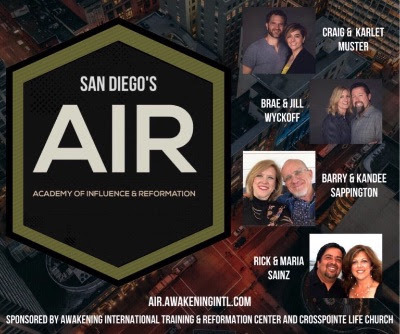 San Diego’s Academy of Influence & Reformation (AIR) is a fast-paced immersion designed to saturate you with Kingdom Principles, Kingdom Power, and Kingdom Encounters. We train people like you who are hungry to discover who you are in Christ and why you were created, equipping you with the ability to invade your sphere of influence. We desire to see you transforming those places with God’s truth, power, and love working in and through you. AIR is effectively designed to be empowering, impactful, and personalized. This six-week course offers classes once a week, on Wednesday evenings, so that you receive the greatest benefit while minimizing the impact on your current work and life routine. This transformational immersion will take you through a holistic approach—Identity, Community, Expression—to advance you in the areas of leadership and influence, with special attention to discovering and developing your own unique calling. We are so pumped for our next worship night. God is doing some cool stuff here and we love sharing it with you all, our kingdom family. Come ready to have some fun. As always food is provided, if you want to bring anything to share appetizers and desserts are always good. We love you all and can’t wait to see you! Join Jerame & Miranda Nelson, Che Ahn, Dr. Mark Chironna, Sean & Christa Smith, and Andrew Hopkins for Glory to Glory. This conference celebrates 3 years of the Fire & Glory Outpouring! We are so excited to announce we are hosting a Movie Premier of Thin Places. Come out and join us for a movie night and meet the producer of this great film Rebecca Friedlander! Featuring Heidi Baker, John and Carol Arnott, Ray Hughes, Emma Stark, Kevin and Rose Sambrook, Andy Raine, Lance Canter, Charity Bowman Webb, Mary Hamilton and some of our very own! Travel, intrigue, and deep spiritual truths carried in this epic film! Shot on location in Ireland, Scotland, and England, follow the thread of revival history from the 5th century to the 1900s. 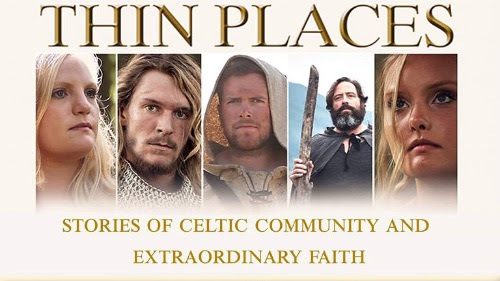 Producer Rebecca Friedlander takes you on an incredible journey through Celtic lands to discover a rich heritage of faith! Learn practices of faith held by the early saints and hear from modern leaders on how to apply these truths today. Bonus content: Bloopers and “making of” footage, and added interviews! Hey friends! 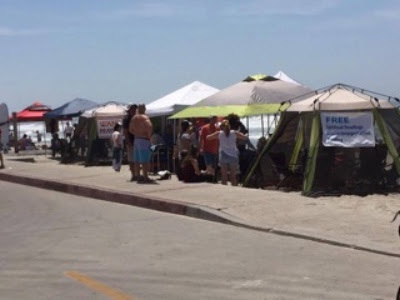 Our first Day At The Beach for 2019 is coming up and you’re invited to join us. Prophetic prayer warriors, prophetic artists, & acoustic musicians are welcome. 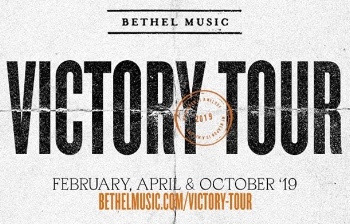 Let us know you are coming. If you show up early enough for 8 am set-up, you could join us for breakfast too! 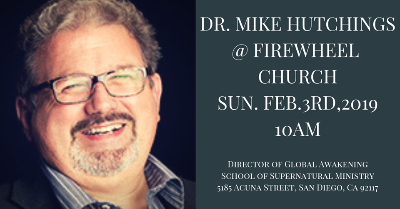 Firewheel Church welcomes Global Awakening School of Supernatural Ministry director Dr. Mike Hutchings. This is going to be amazing! Invite everyone! James Nesbit and Ed Watts are coming back!! Join us for 2 fantastic meetings! Bring your kids!!! Join Seth Dahl as he hosts a 3-hour Revival Families event! Don’t worry about your children getting bored… there will be plenty for them to experience! We will have fun teachings and activation for the whole family so your family can learn practical ways of living in God’s kingdom together! If you’ve ever struggled to teach your children about God and revival, this workshop is for you! Seth created this event because in 15 years of ministry he’s never seen as much fruit as when guardians, parents and children learn to hear God and be in God’s presence as a family unit. There is something very powerful about a whole family experiencing God together! Your children will love learning under Seth’s contagious joy and childlike heart. They will come away knowing who God has truly made them to be. They will also learn about hearing God’s voice and working together with Him to see the sick healed! Parents, you will enjoy Seth’s wisdom and love his practical nuggets of truth. 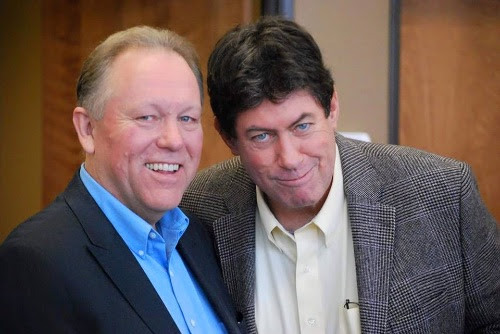 You will see him model what he has learned over the last 15 years about how to teach kids to understand and connect to God! You will get hands-on experience and tools for leading and equipping your children spiritually. Come join us on this amazing family day filled with God’s presence and revival! 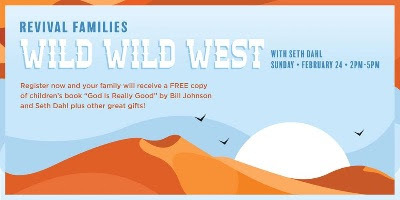 All families will receive a free copy of a book Seth wrote with Bill Johnson titled, God Is Really Good! 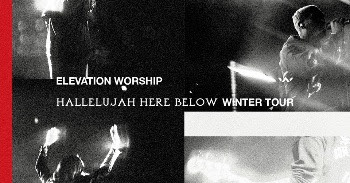 Elevation Worship will be at Skyline Church! Don’t miss this powerful night of worship as we encounter Jesus together! 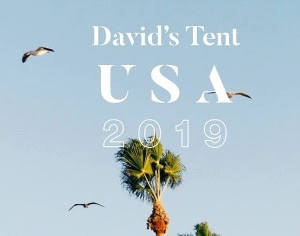 David’s Tent is a 3 day Christian worship festival that has been gathering the passionate worshipers for the past seven years in the UK and across Europe. This year we are branching out to the US in San Diego, CA. for our first ever gathering outside the UK. Our desire is to give up an entire weekend to come away together and worship our Father. Intimacy with God is the essence and heart of David’s Tent. It is, a moment in time to be inspired, encouraged, and commissioned to partner with the Father to see the earth look just like heaven. David’s Tent is open to all from across the Body of Christ. The 3-day gathering features international and local musicians leading non-stop worship, onsite camping, break-out sessions with guest speakers – plus fellowship, picnicking, prophetic art, and lots more! CaliforniaConnecting.org is a new website that is intended to UNITE the Body of Christ in order to advance the Kingdom of God! CaliforniaConnecting.org showcases what the Holy Spirit is doing throughout California. The Body of Christ must become more organized AND unified in the battle, in order to win the war for California! CaliforniaConnecting.org is a Website designed to showcase what the Holy Spirit is doing throughout California AND to invite participation. As the Body of Christ accepts their mandate to work together advancing the Kingdom of God, we will become that well oiled unit allowing for a greater impact THROUGHOUT California. The Body of Christ must become more organized AND unified in the battle, in order to win the war for California. FACEBOOK: Go to our California Connecting Facebook group and request to join. Our Facebook group is focused on legislative action and prayer items relating to government. If you do not already have WhatsApp, click here to download WhatsApp for your Android, iPhone or Windows mobile device. Send an email to info@californiaconnecting.org and include your phone number to request to join our WhatsApp group. An admin will approve your request to join and you will then see the “California Connecting” chat appear. Contact info@californiaconnecting.org if you have any events, prayer calls or other activities that we may promote. 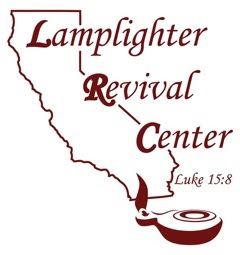 Our Mission: To bring revival and restoration to the world through the gospel of Jesus Christ with the demonstration of the power and love of Christ!